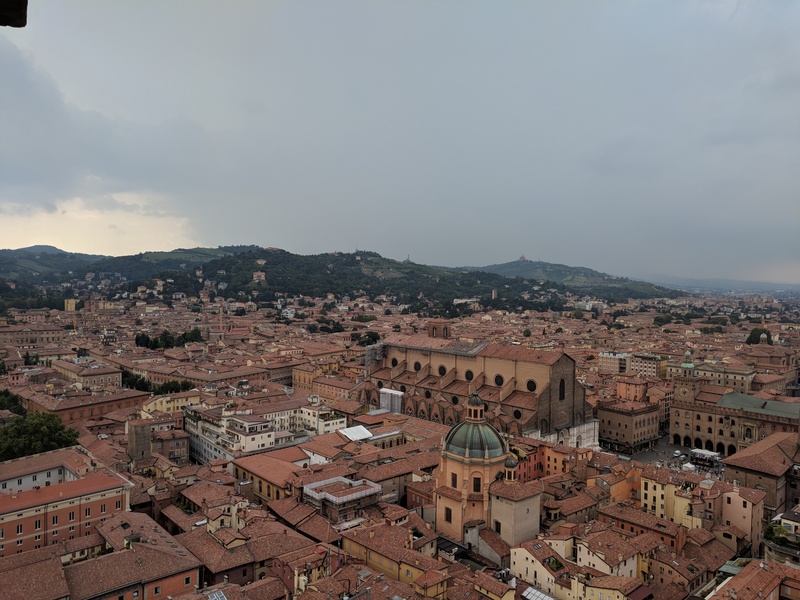 Bologna and Piazza Maggiore from above, with an infrequent rainstorm forming in the hills to the south. 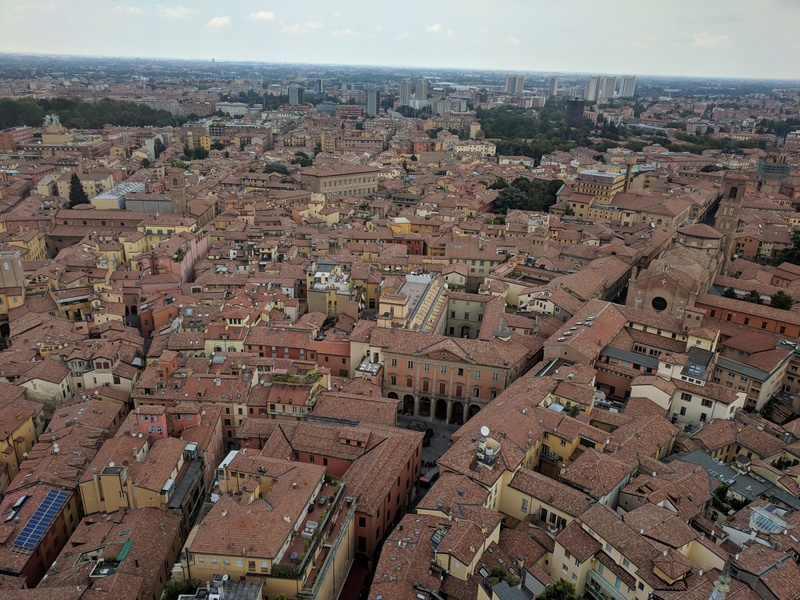 In Bologna you walk slow. The sidewalks in the center of the city are all covered by tall arched porticoes, so you can walk for blocks in the rain without getting wet. People sit outside tabaccherias or on the steps of Piazza Maggiore, smoking cigarettes and taking with friends as they watch the sunlight fade from the orange-yellow hues of the stucco buildings that line the narrow streets. 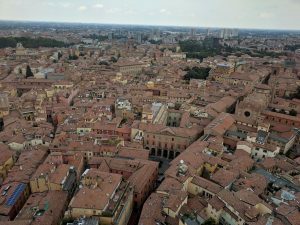 It is an old city, built in pre-Roman times and fortified with a huge brick wall that still stands today, separating the historic center from the more modern neighborhoods outside. Inside the walls it is easy to get lost. The cobblestone streets seem to turn at random and often look the same, but after spending two weeks wandering the city with my friends I generally know where I am going. If I were in Madison, today would be the first day of class, but in Italy the semester goes from October to February, so it is still summer in here in Bologna and most students haven’t returned for the year. I thought that once the program began things would be busy and stressful, but I was wrong. I’ve been chilling all week long. At the start of the program they put us in a four-star hotel in the center of the city for two weeks while we look for a place to live if we haven’t already. I was lucky to have found an apartment before I came using a service that the program provides, so I didn’t have to worry about calling people, setting up apartment showings (in Italian), and getting turned down over and over again, as my friends have had to endure. 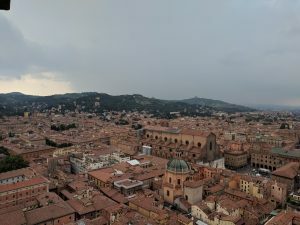 If you come to Bologna, find a place to live first because by mid-August there are only a few dirty double rooms left. Usually I hang out all day with my new American friends. Jack and Teddy are from UNC and Cas goes to Tulane. Together we have a lot of time to kill so we hang out in the park near our hotel during the day and wander the streets when it gets dark, looking for a cheap restaurant or bottle of wine. We wake up every day and eat free breakfast at the hotel, go to an orientation meeting for a few hours, then lounge around all day until its time to eat. I suppose this is living. 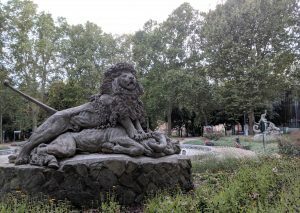 Statue in Parco della Montagnola, a good place to chill. Our Italian isn’t great, sometimes laughably poor. But the same is true for most of the 33 students in our program. While a few are fluent, most have to get by with simple sentences and a limited vocabulary. We’ll get there eventually. But the more I talk to locals, the better I get at speaking. Once I say a sentence in Italian I can usually remember how to use it, so I can reuse the same phrases with more confidence in later conversations. Slowly my conversational limits are expanding. 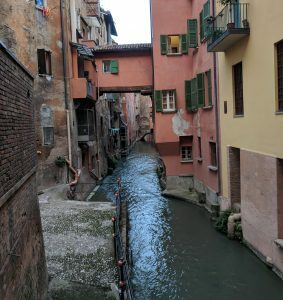 One of the underground canals that run underneath Bologna. 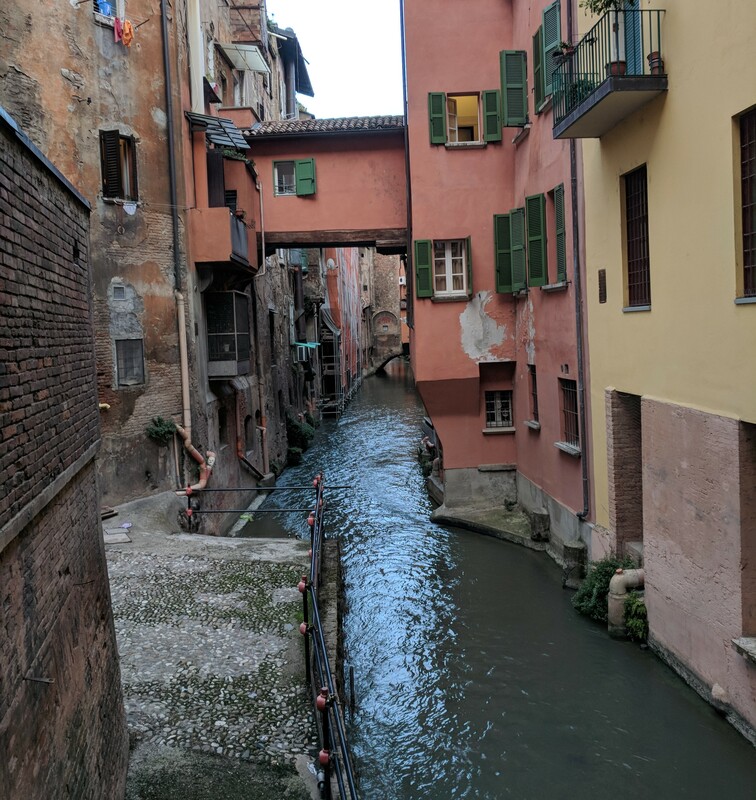 In Roman times canals made it easy to transport materials across Italy and Bologna was a major port city even though it is nowhere near the coast. The best way to learn new words is by asking a native speaker and living with one means I can ask whenever I don’t know how to say something. I moved from the hotel to my apartment a few days ago. It’s a fifteen-minute walk outside the walls but it’s in a nice neighborhood close to a park and a grocery store. I climbed to the third floor of my building and knocked on my door. A short, round-faced Italian opened the door with a smile, my roommate Giovanni. Giovanni is always laughing. He comes from Pescara, three hours by train to the south, a chubby vegan mathematics major in his second year of university. He is proud of the fact that he speaks English almost as well as I can, so we can have intelligent conversations in English but eventually I make him speak to me in Italian. Then the conversations move slower and are not as interesting, thanks to my limited vocabulary. Now that I’m settled in to my own apartment, the days move by slowly. I sit on the balcony off my kitchen and read or run laps in the park. Sometimes I go into the center of the city just to walk around and watch the locals as they sit around talking, enjoying the summer. The tight streets and red roofs of the city center with newer neighborhoods on the northern outskirts.